For some, the third time’s a charm. But for the girls’ tennis team, the third time is, hopefully, just like the other two. 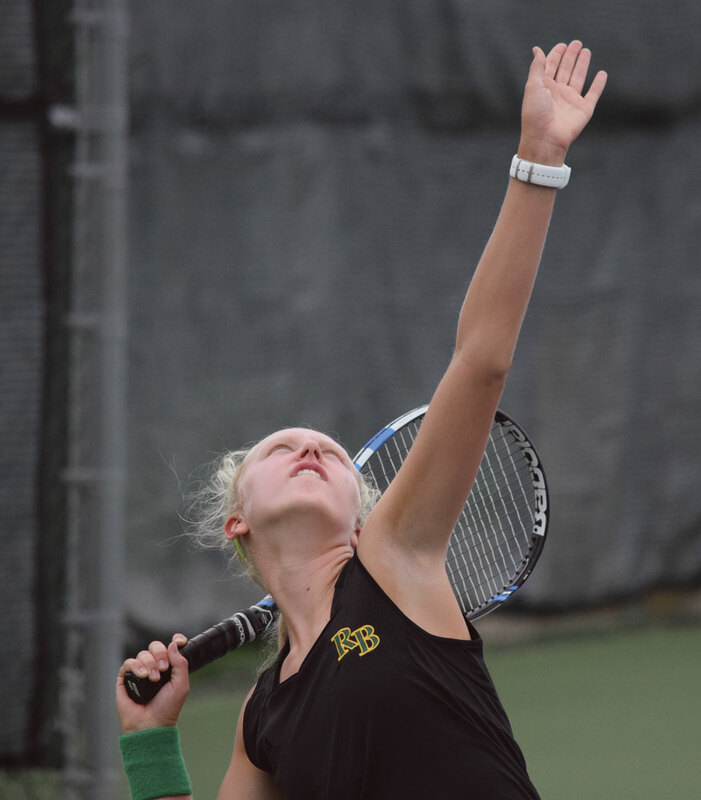 After winning back-to-back state titles, the Lady Bruins are looking to begin their third consecutive run for the state championship on Monday, Sept. 26. Beginning the 2016 campaign with an explosive start, RBHS has established their dominance in the sport yet again this year against their competition, which includes rivals such as the Jefferson City Jays and the Hickman Kewpies. “I’m liking our chances if we play in the upper range of what we are capable of doing,” veteran head coach Ben Loeb said. Going into the postseason, however, there remains the important question of whether the team will still have the ability to perform at the same level as previous years with the losses of key graduates Ronni Farid and Hannah Pohl, as well as Tess Lovig. There is, however, little need to worry in the eyes of junior Katherine Dudley. She thinks that the departure of senior talent will not have a substantial effect on the team’s ability to perform against their opposition. She believes because of the addition of other key players on the team this season, they will be able to continue their success. These “strong players” include freshmen Corinne Farid and Mary Hose. Both players have contributed heavily to the team this season through their play. As a freshman, however, the thought of playing against elite high school competition in the postseason is somewhat nerve-wracking for Farid. Despite this, she still thinks that her previous tennis experience with Hose will help them and the team throughout the entirety of the postseason. “Mary and I are confident because we’ve played together through [the United States Tennis Association] tournaments and also throughout a lot of our practices,” Farid said. Junior Faith Wright, who now stands as the team’s top player since Lovig’s departure, believes that although RBHS will need to remain focused throughout the postseason, they should still enjoy the game and let success follow. Before heading to Springfield to defend their titles, however, the team will need to accomplish the first step to the championship: the district title. Beginning Sept. 26, RBHS will face a multitude of familiar competitors from the beginning to the end of the tournament, including crosstown rivals Kewpies and Battle Spartans. Do you think the team will be able to clinch a third state championship this postseason? Comment your thoughts below!